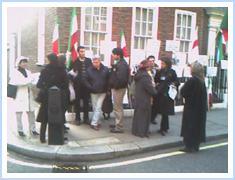 British Iranians staged a silent picket outside the Lib Dem HQ, in Cowley Street, Millbank. The picket was in protest at remarks made by Lib Dem Baroness, Emma Nicholson, in the European Parliament, who referred to the Islamic Republic as "an advanced form of democracy in the region". The protesters, mostly professional, took time off work and braved the cold London weather, and stood outside the Lib Dem HQ, handing out leaflets - see below - to passers by and Lib Dem members who were visiting the party HQ. After about one hour, a Lib Dem official first protested to the police that the protesters are using a residential property to display their posters, but the police reassured the official that the owner has given her consent after speaking to the protesters. Soon after, the Lib Dem chief executive, Lord Chris Rennard, stepped out of the HQ to speak to the demonstrators. The demonstrators explained that Baroness Nicholson's constant support for the Islamic Republic is providing the mullahs with a lot of undue credit and propaganda. Lord Rennard was told any comparison of the Islamic Republic with other countries in the region is an absurd comparison. The Iranian people have struggled for the last 100 years for freedom of speech and an accountable government. The analogy would be to tell a Chinese dissident that the Chinese government is not as bad as North Korea or the Pol Pot regime! "No comparison with other countries in the region is relevant" Lord Rennard was told. Lord Rennard was also reminded about another Lib Dem peer who had said "Human Rights in Iran should not be compared with Western Human Rights standards but with that of the region. 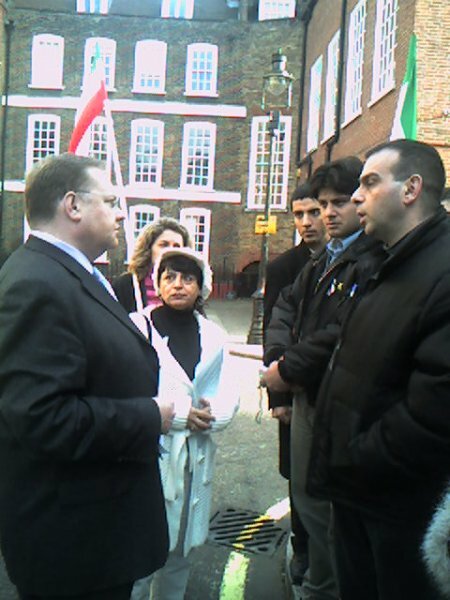 "There should be no classifcation of Human Rights", the demonstrators told Lord Rennard. "Human Rights is universal and it should not be classified by race or region". Lord Rennard agreed and then asked what the protesters' demands were. "We need a clear statement from the Lib Dem party on what their policy towards the Islamic Republic is. Do they support Emma Nicholson or do they distance themselves from her? If we do not have a satisfactory answer we will continue to campaign amongst British Iranians not to vote for Lib Dems and will stage hunger strikes outside the Party HQ" The demonstrators told Lord Rennard. Lord Rennard promised to contact Sir Menzies Campbell, the Lib Dem Shadow Foreign Secretary and try to get a clarification on the party's policy on the Islamic Republic. The protesters then thanked Lord Rennard and said they will await the reply by Sir Menzies Campbell. Lord Rennard however refused to give a statement to the journalists covering the event. Freedom Loving People of Britain! In a recent debate in the European Parliament, the Lib Dem Baroness, Emma Nicholson was the only MEP who praised the medieval theocratic state of the Islamic Republic of Iran, calling it “a more advanced form of democracy in the region”. Islamic Republic is in fact a brutal, backward, religious dictatorship. Only Shiite Muslims can stand as candidates in the so-called "elections", but not all the Shiites; only the ones who accept the state interpretation of Shiite Islam, even then they are still vetted by the unelected Guardian Council before the elections and after the elections, yet despite all this the state used all its apparatus to cheat in the last presidential “elections” too. We wrote to all Lib Dem MPs, MEPs and Lords to clarify their position on the Islamic Republic and on Baroness Nicholson’s continuous support for the mullahs. Only Lord Lester distanced himself from Baroness Nicholson. The leader of the Lib Dem MEPs, Chris Davies also replied to us but backed his colleague, Baroness Nicholson. Interestingly he also got Iran and Iraq mixed up in his reply! We believe that none of the above are neither Liberal nor Democratic values and at a time when the Iranian president calls for another country to be wiped off the map, and the Islamic Republic technology explosives is killing British soldiers in Iraq, the Lib Dem leadership by not publicly distancing itself from Baroness Nicholson has shown gross incompetence and misjudgement. Would you trust such a party to be in charge of international affairs? good on you for exposing Emma Nicholson's ill thought out attempt to sound radical. And of course, democracy is a universal concept - not a regional one. That was absolutely a great idea, right time, and right place. No re-election for people who supporting terrorist sponsored government. Iran deserves a true democracy not the kind described by the Baroness who should have known better. Many thanks to those enlightened British Iranians who corrected the erroneous perception that the Islamic republic of Iran is a so-called advanced form of democracy. Such a false representation of the facts about what is happening in Iran by the Baroness and others like her undermines the very tenets that made Britain a pioneer in that respect. Perhaps the Baroness should educate the Iranian government and its misguided leaders to learn from Britain's parliamentary process and support genuine freedoms in Iran today. This seemed to me to be similar in implication to the Nicholson comments- so far no-one has said much about Simpson's apparent apology for the Iranian system. Since the pavement and street in front of the Liberal Democrat HQ (as well those in front of the nearby Conservative and Labour party HQs) are within the Serious Organised Crime and Police Act 2005 section 132 Designated Area around Parliament Square, did the demonstrators apply in writing to the Metropolitan Police Commissioner "at least 6 clear days" or "at least 24 hours" in advance ? The Lib Dems can support who they please. That's how things work in this country, and if you don't like it you should go somewhere else. BTW, every single claim you make about Iran also applies to Saudi Arabia. Why aren't you complaining about Blair arming that country with more weapons? Or doesn't he pay you to do that? How very brave of you to stand up for your opinions "anonymous". "The Lib Dems can support who they please. That's how things work in this country, and if you don't like it you should go somewhere else." Of course they can support who they want. But they should expect to be pulled up for it too. THAT is how this country works. In fact, the demonstrators are showing a better grasp of the working of this country than you: they lodged their protest - peacefully - and were polite to the Chief Exec when he came to talk to them. "BTW, every single claim you make about Iran also applies to Saudi Arabia. Why aren't you complaining about Blair arming that country with more weapons?" Errrmmmmm.... Because they are, errrmmm... Iranian? Or is that not relevant? Or am I missing something? Or indeed, are you missing something? Why should the UK host a gang of exiles that want to overthrow a gvernment? If they are Iranian they should go to Iran. Subversives aren't welcome here. What a stupid cow she is. Word's fail me. To find out more visit: turbo-charged site. It successfully exposes FREE information and covers turbo-charged related stuff. To find out more visit: turbo-charged site. It successfully exposes FREE information covering Traffic and turbo-charged related stuff. Are you tired of getting nice compliments on your blog, when really you're not makeng the kind of money that you deserve? Now you can join a completely FREE program. No buying and No selling. FREE to join. All you do is refer customers. To get started fast, click here: the best home-based businesses site. It pretty much covers the best home-based businesses related stuff and it's FREE to join. "4) A REGIME WHICH EXECUTES UNDERAGE MINOR"